A quick update on the growing smart contract patent landscape. I’ve written before about the number of patents mentioning smart contracts here, here, and here. The number of filings continue to grow at a rapid pace. As of May 30, 2018, we know of 267 patent filings in the USA that mention “smart contracts.” These filings include issued patents, and published patent applications. There are surely more we do not know about. The chart below shows a breakdown of filings by the year they were filed. Lawyers are a natural fit to understand the implications of blockchain technology on society. Why? Lawyers can understand the implications of blockchain technology, because blockchain technology deals with concepts that lawyers have been wrestling with for millennia, namely: trust, exchange, agreement, consensus, and value. Arguably the most central concept for organizing human society is trust. The degree to which people trust each other, and how they manage those trusted relationships is often intermediated by lawyers. Lawyers craft agreements for clients based on the level of trust between the parties to the agreement. Lawyers are not necessary for trust to exist, but they often bridge a “trust gap” between parties that do not know each other well. In this sense, lawyers function as trusted third parties. With the advent of Bitcoin the trust equation changed. Now it is possible to “trust” information sent over a network you don’t trust among a group of participants you also don’t trust. To be sure, there is an element of trust that still exists. Namely, the participants in the network must trust the way the network is run, and the technology that underpins the network. The point is that lawyers have a natural affinity for managing trust relationships, and they should not be turned off by this new technological approach. What are the terms of the exchange? Are the terms of the exchange clear? When has the exchange started? When is the exchange complete? When would it be unfair for it to not finish? Many more issues can arise, but these sorts of questions are common place in the legal world. For networks that use a blockchain, distributed ledger, shared ledger, or other decentralized exchange network, the answers to these questions are often found in the network protocol. The protocol determines how exchanges work and what types of exchanges are possible. Similarly, the protocol will also determine the involvement of other parties in said exchange. Knowing the rules of exchange is something that lawyers already advise their clients on, and answering those same questions with respect to blockchain applications is something they can and should do. In many cases agreements are often contracts, and contracts involve at least two parties coming to a meeting of the minds as to the terms of their agreement. That’s a wordy way of saying “I’ll do X, if you do Y.” Historically, agreements have been memorialized in a contract. Problems arise when one of the parties claims that the terms of the contract weren’t met, or that the contract was invalid. Blockchain technology creates the opportunity to create binding agreements on a blockchain network. A potentially huge shift in the practice of law is likely to come in the form of smart contracts. A smart contract is a way for at least one party to memorialize the terms of an agreement in computer code that is distributed across a blockchain network. The lawyer’s traditional role of helping clients come to an agreement on a contract will not change as a result of smart contracts. What may change is how that agreement is memorialized. Here lawyers would do well to learn about smart contracts and how to code them. With each passing year more and more clients will want that option. Traditionally, consensus on the veracity of information in a network (be they financial networks, groups of experts, etc.) has involved reconciliation processes and other mechanisms to determine what information and records are correct. Perhaps the biggest change brought on by Bitcoin and other blockchain networks is a new way of achieving consensus on information transacted on a network. As transactions occur on a blockchain they are packaged into blocks of transactions. If certain conditions are met that block becomes part of the official record and the chain of blocks grows. If enough participants in the network agree, that block becomes part of the official record and consensus is achieved. Determining when and how consensus is achieved is well within a lawyer’s toolkit. Being able to assess whether information is part of the official record is something lawyers already do, and something lawyers will have to do more of when their clients wish to use blockchain technology. A concept more abstract than trust may be value. What is valuable to one may be valueless to another. How and why we value something may be intrinsic to the thing in question, or extrinsic to that thing. Regardless of why something has value, lawyers often help their clients determine the value of things. They also help clients secure valuables, as well as ensure their client receives fair value in an exchange. In disputes, lawyers often have to advocate why something should be valued a certain way on their client’s behalf. The fact that magic internet money is valuable to some, and not valuable to others, is largely irrelevant to the job of an attorney. Thinking abstractly about why something is or isn’t valuable is already a large part of the job. Lawyers should not be worried about blockchain technology. In fact, they should embrace this new paradigm shift towards decentralized interactions. The legal issues lawyers deal with day to day will not be disrupted by this new technology space. They will merely be presented in a new format. It’s about that time again to check in and see how many patent filings mention smart contracts. The first time I wrote about this was in June ’16 here, and then again in March of this year here. Smart contracts are very much a part of the current zeitgeist (sidebar, if you ever want to feel like an idiot read Hegel), and all the rage in the B2B world. The first time this search was run there were seven hits. The second time the search was run there were fifty-six hits. This time? One hundred and thirty six filings mention smart contracts. This is less than seven months since I last ran the search when the number was fifty-six. Of those filings, eight are issued patents and 128 are published patent applications. The first chart below shows the growth in filings by publication year. The second chart below shows the number of filings by the year they were filed. Each year there are more and more patent filings that we know about that are related to smart contracts. What the second chart shows us is the growth in the number of filings. Those numbers are not final, as there are undoubtedly still more filings that are not yet public. 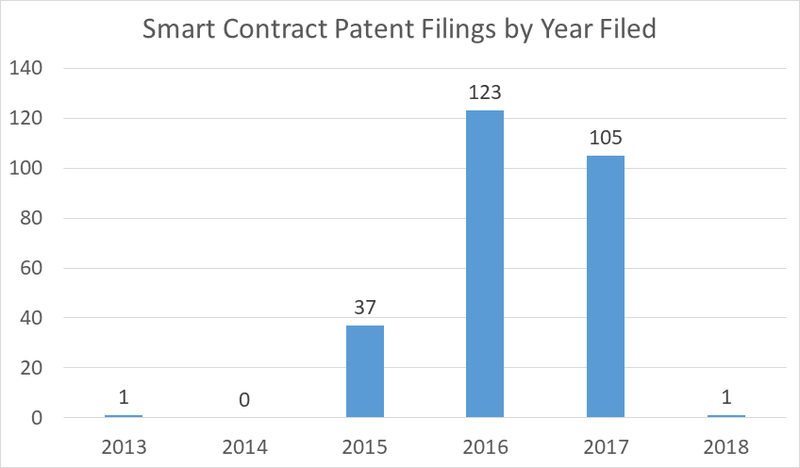 Based on the trend shown by these numbers its not unrealistic to assume that twice as many patent applications have been filed in 2017 that mention smart contracts than were filed in 2016. 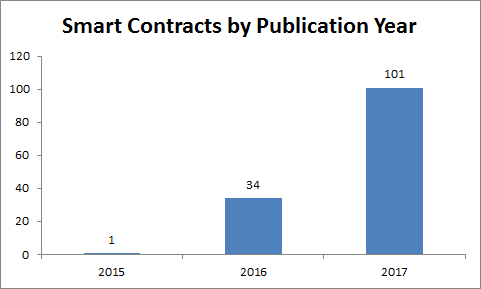 That would be around 150 patent applications filed in 2017 making use of smart contracts. 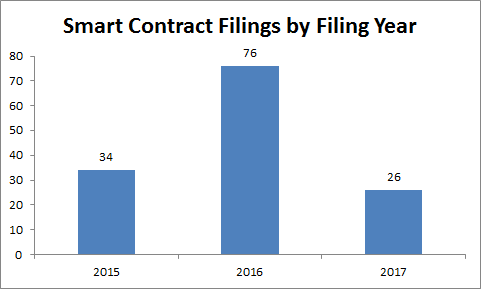 More broadly speaking, the growth in the number of filings that mention smart contracts is in line with what we would expect from the maturing blockchain industry. I wrote about this emerging blockchain patent landscapein March of this year. Companies, large and small, are moving to protect their innovation in this space. Bigger numbers are on the horizon. Say you’ve got a great idea to use “blockchain for [insert literally any problem domain]”. First off, congratulations! That sounds cool. Now you think to yourself, “I should patent that!” Maybe. Before you go through the long and costly process of seeking patent protection there are some questions you should ask yourself, or your attorney should ask you. This is the most important question, and one that requires serious introspection. Are you pursuing a blockchain technology solution because you are trying to capitalize on a hot new trend? Do you just need a new data storage solution? Have you really hammered out the pros and cons of using blockchain technology? Do you want to build your own blockchain, or use a public blockchain or some private blockchain service? Your answer to these questions will of course depend on your goals, constraints, and the data you are dealing with. If you are convinced that you do want to pursue a blockchain technology solution to your problem you should have answers to at least the following questions. What data do you hope to store using blockchain technology? It doesn’t make sense to throw any old data in a blockchain. I mean, you certainly can, but that would be wasteful. Typically, you want to put “significant” data in a blockchain. For example, data that might be usefully stored on a blockchain may be mission critical data that you don’t want to lose, however, then the question becomes is access to said data time-sensitive? If the answer is yes then a blockchain solution may not be a good fit. Have you considered any privacy restrictions on the data you are dealing with? For example, is the data personally identifiable information, such as healthcare data? If it’s healthcare data, have you properly walked through permission controls that need to be put into place? “We’re just storing a hash of the data!” you say, and yes that’s great, but are you really comfortable with that? Similarly, how will the data be entered into the system? Is the data going in solely under human direction? Is there some type of machine-machine communication going on? Good candidate datasets for storage in a blockchain solution are “shared datasets that are shared amongst parties that do not fully trust each other.” That is, parties that may be incentivized to change data to the detriment of other parties involved in the network. Remember, blockchains are tamper-evident and so can cut down on funny business by participants that don’t have a majority of the computing power necessary to overrun the blockchain the data is stored in. Transaction verification should be trivial, but if you are not dealing with public blockchains (e.g. Ethereum, Bitcoin) then you may need/want additional verification steps. If so, what are the additional steps taken as part of the verification process? Even if your idea involves the use of public blockchains you may want to include additional transaction verification steps that occur prior to interfacing with the public blockchain. Similarly, how is consensus handled in your blockchain solution? Inventing a new consensus algorithm is probably not a good idea. It’s better to use an existing consensus mechanism. This calculus changes if your blockchain solution does not make use of tokens that are native to your new fangled blockchain network. If you are not using tokens (e.g. bitcoin, ether) as part of your solution, why are you trying to use blockchain technology again? Does this interface with legacy systems? How do you envision your blockchain solution fitting into your existing business model? The blockchain solution will either interface with legacy systems or seek to replace legacy systems. Both paths have their own pitfalls, and their own patent considerations. Along these lines, is your blockchain solution going to be solely internal to your business, client facing, or a combination of both? You need to consider exactly how your use of blockchain technology interacts with these internal systems and external systems. A blockchain network is made up of all sorts of different participants. Have you figured out who can participate in your blockchain network and how? Do you use an existing blockchain network, such as Bitcoin or Ethereum? If so, have you considered privacy requirements for your data, and how they might be met on those networks? If you are designing your own blockchain network, are there checks performed prior to participation in the network? What would those checks look like? Accordingly, do you have a validation process in place to validate information used as part of any checks on participation? This is less of an issue if you are spinning up some sort of permissioned blockchain where there is a certain level of trust afforded each participant. Blockchain technology is not a panacea for every problem you face. In fact, blockchain technology is really best suited to situations where you have participants on a network that don’t fully trust each other, want to update valuable data, and don’t fully trust the network. If that is not your situation, you need to think about at least the questions posed above, but probably many more. 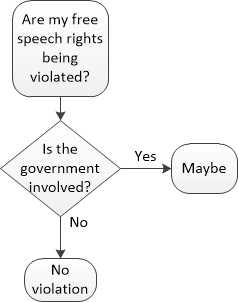 I made a handy flowchart to help you determine whether your free speech rights are being trampled.